These Sugar Free Jelly Bellys Will Destroy Your Intestines! Are you looking for me to recommend you a sugar free jelly belly that is safe to eat? Then I’m afraid you are going to in for an unfortunate surprise. 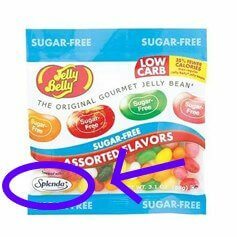 After a long and tiring session of searching, I have found no sugar free versions of jelly bellys that do not contain the dangerous product, Splenda. Let’s get through this quickly. Maltitol is a sugar alcohol. It gives you diarrhea very, very quickly. This is because it cannot be actually absorbed by your body, so it’s no wonder (With it at the top of the ingredients list) that this product acts similar to a laxative. Splenda is another product that is simply not good for you (It contains Chlorine you know!) Stay away from this. Honestly, I wouldn’t even bother going near this product simply because it contains these two items, but I will give you a much better reason in the next section. So I bought a bag of these before heading into a movie theater. The movie let out at about Midnight, and I got home around 1:30am. This whole time, my stomach just hurts. I feel really bloated, and I’m stinking up the whole place with gas. When around 2 o’clock rolls around, I am officially out of commission. Sitting on the toilet, I let roar some of the nastiest diarrhea ever (And with all my health problems, I have seen some pretty nasty diarrhea in my days). 2:30, and it’s still coming. To help demonstrate how this feels, I have provided for you a song from “Mr. Bungle”. It continues on till around 3am, I am exhausted and I go to bed. Seriously…don’t eat these Jelly beans. Would YOU want to eat a product with that type of of warning? I sure don’t (and wish I hadn’t). These Jelly Beans remind me of the hilarious sugar free gummy bears that you can buy on Amazon. These gummy bears (Haribo Sugarless Gummy Bears) cause the same effect that I had above. You can apply all of those headlines to the sugar free jelly bellys too. They were a bad decision. 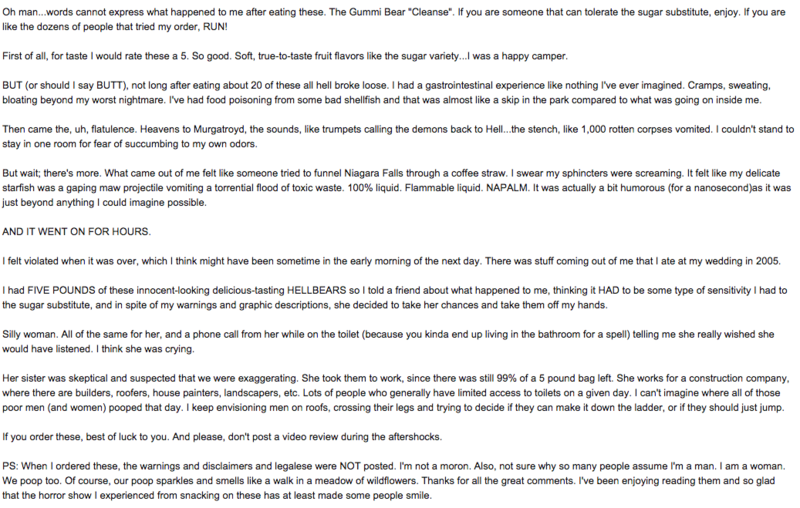 Here are a few reviews in full that I took screenshots of. They’ll probably be a bit hard to read here, so feel free to go look at them on Amazon. There are plenty more where that came from!